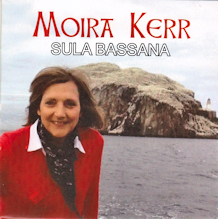 "Sula Bassana" is the scientific name for the Northern Gannet and Moira has been fascinated by the Bass Rock which rises from the sea near North Berwick in the east of Scotland and which is a major breeding site for these birds. 150,000 Gannets nest there each year and it is the largest single rock gannetry in the world, described famously by Sir David Attenborough as "one of the wildlife wonders of the world". When viewed from the mainland, large regions of the surface appear white due to the sheer number of birds. Moira was impressed by a journal written by one of the Jacobites held in 1746 in a prison that was built on the rock. The prisoner wrote: "We were taken out in twos twice a day to take the air and we envied, with reverence, the birds their freedom". This prompted Moira to write the song from his perspective. The reaction to the song at live performances has been so good that Moira decided to record it. 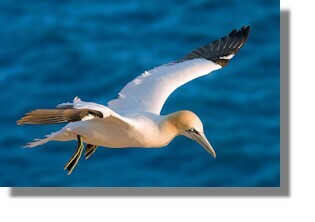 (The picture here of a gannet is via Wikimedia Commons). The excellent arrangements on this EP include backing from Ritchie Young (keyboards, bass, accordion), Frank McGuire (percussion) and A Lora Voices (backing singers). There is a second track (also with backing from Ritchie Young and Frank McGuire) with words and music by Moira - "The Silver Brooch of Lorne". While reading Barbour's "Life of Bruce" a battle which took place near Bridge of Orchy caught Moira's imagination. Bruce had been ambushed and was outnumbered three to one by members of clan MacDougall. During the battle, the King lost his famous "Brooch of Lorne". A brooch of that name is in the ownership of the MacDougall of Dunollie Preservation society and is kept in an Oban bank vault (but is probably a resetting of the stones from an earlier brooch). You can see a picture of the silver turreted brooch at Dunollie.org - Brooch of Lorn. Bruce is reputed to have thrown his broken sword into a nearby small loch, Lochan an Arm. This has been dredged twice but the sword has never been found - yet! This CD can be obtained direct from Moira at a cost of only £3.50 including post and packing in the UK. There is an additional airmail postal cost of �3.20 for European destinations outside of the UK or �4 for the rest of the world. All items obtained from Moira are signed personally by her on the CD insert. The CD can be obtained via our PayPal secure credit card service and sent anywhere in the world. Just click on the Paypal logo for the appropriate destination below. Click Here to return to the list of CDs and Video.